It’s been quite cold the last few days in the City of Light, with nighttime temperatures dropping to near freezing and the days blustery and damp. 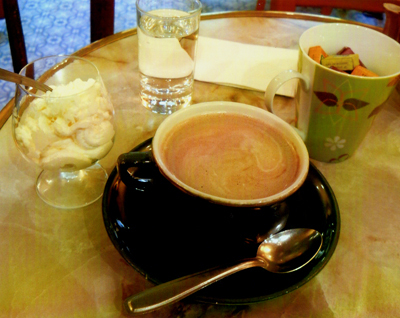 But one of the pleasures of chilly Parisian winters is popping into a toasty cafe or tea room for a warm drink and a tasty dessert. Or perhaps a cognac or two! 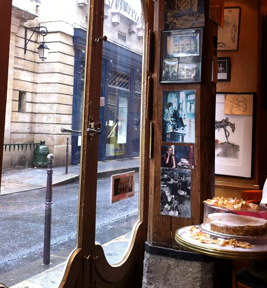 One of my best-loved warm-up spots is a fantastic little bar-cafe-tea room I stumbled upon quite by accident while roaming the tiny, winding Marais streets not far from the Picasso and Carnavalet museums—Royal Bar. The bar offers a wide range of alcoholic drinks (although falls short of operating as a “full bar”), with such French staples as pastis, wine and champagne competing with such refined libations as cognac and calvados as locals’ favorites. There’s also a wide variety of warm drinks, from every coffee concoction imaginable to flavored teas, hot cider and—my favorite—hot chocolate, served with a separate cup of fresh whipped cream to fold into it. 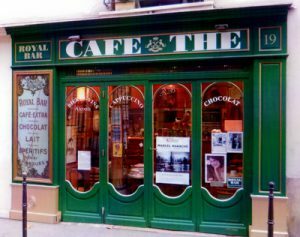 Royal Bar is a bit more expensive than your typical corner café, even in the pricey Marais, but that extra euro or two is well worth the experience of being surrounded by convivial locals in such a quintessentially Parisian setting. Serendipity brought me to Royal Bar. But I’ll be back again and again by choice. Royal Bar is located at 19 Rue du Parc Royal in the 3rd Arrondissement (Metro: Chemin Vert or Saint-Paul). It is open from 10 a.m. to 7 p.m. daily. 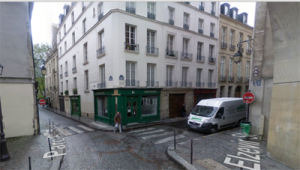 This entry was posted in Bars, Drinks, Food, Marais and tagged Royal Bar by Bob Adams. Bookmark the permalink.